Guitar tab is the guitarists friend. It allows all of us to play our favorite songs. There’s always some guitar player somewhere tabbing out a song, so chances are good you’ll be able to find just about any song you want to learn to play. Even better, chances are you will be able to find one at a level you can play. A lot of the guitar tab easy arrangement stuff can found on the same websites as the more complex arrangements. 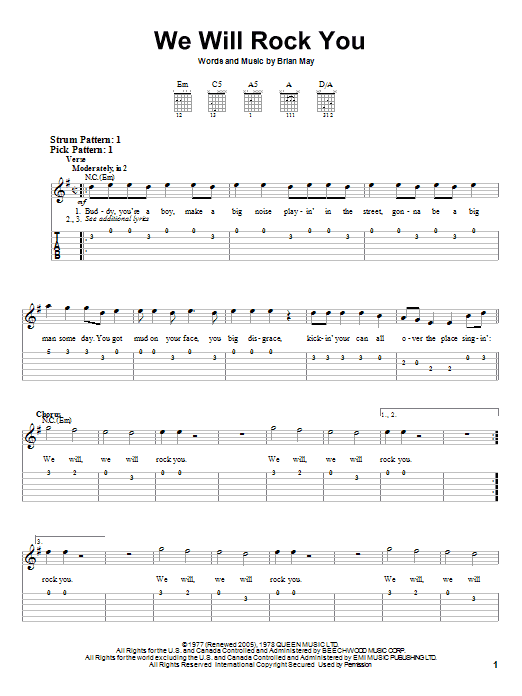 Guitar tab easy arrangements are a great way for beginners to learn to play favorite songs. A lot of beginning guitar players can get bored pretty fast if they don’t get to play something, which makes these easy guitar tab arrangements ideal for instructors to use for students, or even for those who teach themselves to play. An easy arrangement of a guitar tab song is pretty easy to recognize. These arrangement will basically be a stripped down version of the original, often using only those main notes in a riff or melody that are necessary to make the song recognizable. Some easy guitar tab easy arrangements are nothing more than chords with lyrics. In the case of acoustic songs, chords and lyrics are all you need to play a song so it’s easily recognized. Below is an example of an easy arrangement tab version of Queen’s “We Will Rock You.” This is an extremely simplified version because all it gives you is the melody written both in standard notation and in tab format. The full easy version of the song includes chord symbols, which gives a beginner enough information to strum their way through the song without difficulty. The next example is the classic rock riff almost everybody learns when they first pick up the guitar—“Smoke on the Water” by Deep Purple. It really doesn’t get much easier than this. No more than two note played at a time, with no acrobatics necessary. Try it. It sounds really cool and it’s one of those tunes that’s easily recognized. Another song along this same line is Black Sabbath’s “Iron Man.” Check out the two examples below. One shows the song with single notes and the other shows the same pattern with a fifth added above each base note, creating what are referred to as fifth chords. Fifth chords are a standard in heavy metal and hard rock, and typically what you will see when you look at guitar tab easy arrangements. As you become more skilled at playing, you can add notes to these basic arrangements to make them sound fuller and more refined.